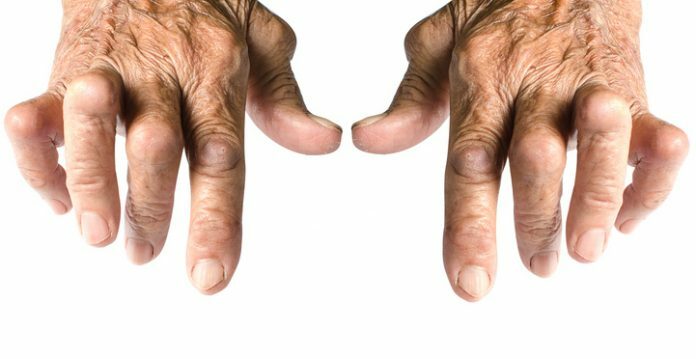 Interaction between genes and environmental factors is widely believed to increase the risk for rheumatoid arthritis (RA), but until now scientists haven’t understood the nature of this interplay. Studies by researchers at the University of Michigan, Ann Arbor, have now uncovered a mechanism by which a particular variant of the HLA-DRB1 allele and exposure to environmental pollutants such as cigarette smoke or vehicle exhausts work together to increase RA risk and the severity of bone damage in patients with the disease. Reporting on their in vitro and in vivo studies in the Proceedings of the National Academy of Sciences, the University of Michigan team and collaborators at the University of Tennessee Health Science Center suggest that their findings could lead to the development of drugs that block the gene-activated pathway and so reduce the incidence of RA and severity of bone damage. About two-thirds of RA risk is attributed to genes, and the single most significant genetic risk factor for RA is the shared epitope (SE), a five-amino-acid sequence motif encoded by the RA-associated HLA-DRB1 alleles, the researchers explain. But RA isn't all down to genes. Environmental factors also influence RA susceptibility. The autoimmune disease is associated with exposure to environmental pollutants such as dioxin-like compounds and tobacco smoke, and RA is more prevalent in urban populations and among people who live near highways, irrespective of whether or not they smoke cigarettes. Prior research has suggested that aryl hydrocarbon receptor (AhR) may play a role in the link between environmental pollutants and autoimmunity. The AhR is an intracellular ligand-activated transcription factor that mediates the effects of polycyclic aromatic hydrocarbons, including dioxin and the byproducts of cigarette smoking. Interestingly, while SE signaling leads to increased osteoclast differentiation and activity, AhR agonists have similarly been shown to disturb the balance between regulatory T (Treg) cells and Th17 cells, and also to activate osteoclasts. Bone destruction mediated by osteoclasts is a major disease severity factor in RA, the team points out. The AhR pathway has separately been implicated in the pathogenesis of autoimmune disease, they note. Give the parallels between SE and AhR pathways, the University of Michigan carried out a series of in vitro and in vivo studies in mouse models to determine whether the two pathways interact in a functional way in inflammatory arthritis. The collective results showed that the SE ligand and AhR agonists—such as dioxin—work synergistically to enhance osteoclast and Th17 cell differentiation, and that the interaction between SE and AhR agonists is mediated by the NF-κB signaling pathway. A series of in vivo studies in a heterozygous SE-positive mouse model of collagen-induced arthritis demonstrated that animals developed significantly worse bone damage when they were treated with dioxin and another chemical AhR agonist. Bone marrow cells from SE-positive collagen-induced arthritis (CIA) mice treated with the AhR agonists exhibited more significant ostoclastogenesis, while their spleens and regional lymph nodes demonstrated higher percentages of Th17 cells, and a parallel decline in Treg cells when compared with either SE-positive but untreated mice, or with SE-negative animals. In vitro studies showed that treatment using the NF-κB inhibitor wedelolactone blocked AhR–SE synergism in a dose-dependent fashion. “…we conclude that the interaction between SE and AhR agonists during osteoclastogenesis is mediated by the NF-κB signaling pathway,” the team states. “We've shown in this study that the interaction between dioxin and the human leukocyte antigen (HLA) gene variant activates events known to be associated with rheumatoid arthritis. And we've demonstrated quite convincingly that this facilitates bone destruction,” says Dr. Holoshitz. Existing RA therapies target the inflammation, but the University of Michigan studies point to a novel potential approach to targeting bone destruction. “Once we have better drugs that directly and specifically address bone destruction in this disease, we’ll have better treatment,” Holoshitz adds.